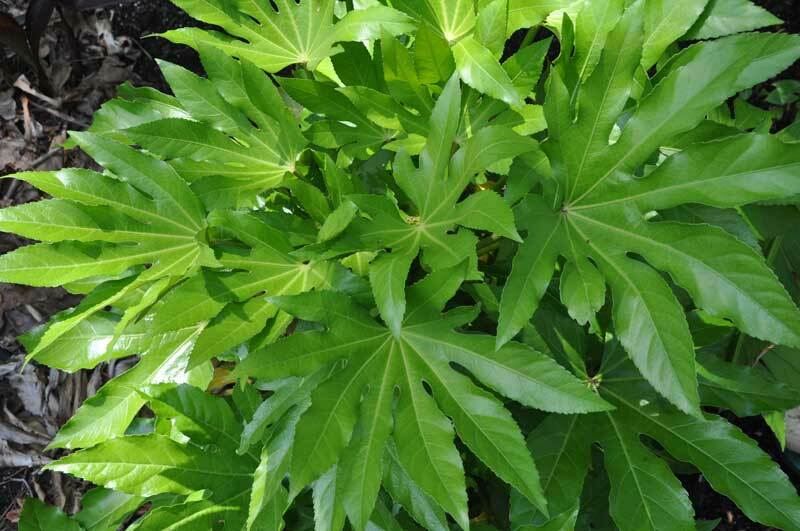 Fatsia has huge, up to 12 in wide leaves that are deeply lobed and slightly serrated. Petioles, or leaf stems, are quite long, and hold the leaves up and out with the plant growing to heights of about 8 ft and about half as wide. The upright stems are covered with prominent leaf scars and mostly un-branched. The weight of the leaves tends to make the plant list to one side or another. Flowering season is fall, but plants must be mature to bloom. Flowers are white, held on a white stalk in small terminal clusters and followed by small, fleshy black fruit. Neither adds much to landscape appearance, and may be almost overlooked. This plant is mainly grown for its outstandingly attractive foliage.